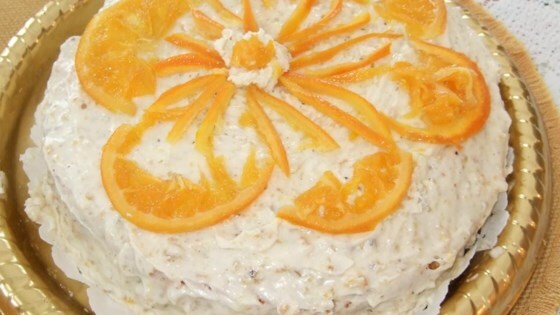 "A beautiful moist light cake with complex and full flavors of oranges and orange peel. Super easy to make, and people love it! Serve in wedges with a mound of whipped cream or ice cream." Place the oranges in a large saucepan, and add enough water to cover. Bring to a boil, and boil for 2 hours over medium heat. Check occasionally to make sure they do not boil dry. Allow the oranges to cool, then cut them open and remove the seeds. Process in a blender or food processor to a coarse pulp. Preheat the oven to 375 degrees F (190 degrees C). Thoroughly grease a 10-inch round cake pan and line it with parchment paper. In a large bowl, beat the eggs and sugar together using an electric mixer until thick and pale, about 10 minutes. Mix in baking powder and saffron (optional). Stir in the pureed oranges. Gently fold in almond meal and candied orange peel (optional); pour batter into the prepared pan. Bake until a small knife inserted into the center comes out clean, about 1 hour. Allow the cake to cool in the pan. Tap out onto a serving plate when cool. This light, moist orange cake has complex flavors and is completely flourless. This is one of the great cakes,it is delicious, warm with fresh cream, & cold, cut into wedges, keeps well in the 'fridge too.